If you didn&apos;t own a Bigwheel as a kid, we&apos;re sorry. You lived a deprived childhood and may not enjoy this story to its full potential. For those that did, stop bouncing up and down in your chair and read a little more. 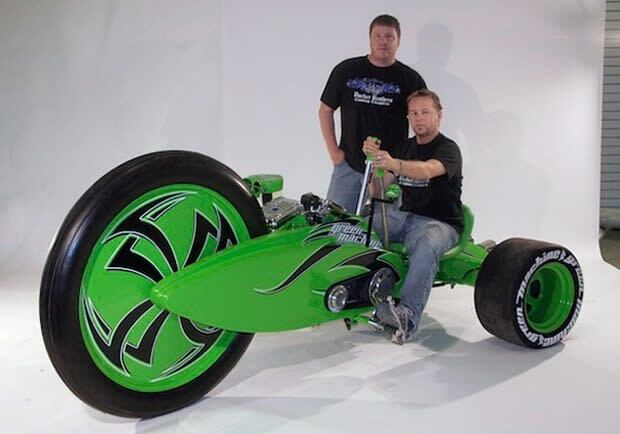 Parker Brothers Choppers have revealed their latest labor of love, the Green Machine, an extreme three-wheeler for those who refuse to grow up. Behind its 45-inch front wheel sits an 80-cubic inch Harley-Davidson Evo engine. What could be cooler than that, right? Try the trike&apos;s steering system. Rather than use traditional motorcycle handlebars or a steering wheel, the Green Machine utilizes two chrome levers that control the direction of the rear wheels. Unfortunately its that same trick element that will probably also keep this beast from ever receiving DOT approval. Until the feds loosen their collars a bit, expect the Green Machine to remain a one-off daydream.